The Sumatran rhinoceros (Dicerorhinus sumatrensis) is one of the most threatened mammals on earth. By 2011, only about 200 of the rhinos were thought to remain living in the wild. Now, an international team of researchers has sequenced and analyzed the first Sumatran rhino genome from a sample belonging to a male made famous at the Cincinnati Zoo. This study reported in Current Biology on December 14 shows that the trouble for Sumatran rhinoceros populations began a long time ago, around the middle of the Pleistocene, about one million years ago. The new insight into the rhinos' demographic history is useful for placing the species' current population status into a broader ecological and evolutionary context, the researchers say. 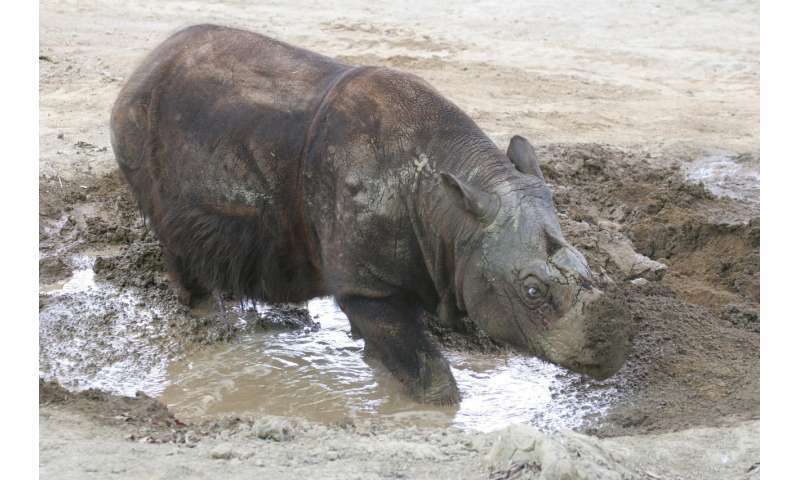 "Our genome sequence data revealed that the Pleistocene was a roller-coaster ride for Sumatran rhinoceros populations," says Herman Mays, Jr., of Marshall University. "This species has been well on its way to extinction for a very long time," adds Terri Roth at the Center for Conservation and Research of Endangered Wildlife at the Cincinnati Zoo and Botanical Garden. The Sumatran rhinoceros population peaked at a time when fossil evidence shows an invasion of continental mammals into Sundaland (a biogeographical region of Southeastern Asia), around 900,000 years ago, according to the researchers. By about 12,000 years ago—the end of the Pleistocene—many large mammals had suffered, and Sumatran rhinos were no exception. Rising sea levels submerged the Sundaland corridor, and land bridges connecting the islands of Borneo, Java, and Sumatra to the Malay Peninsula and mainland Asia disappeared into the ocean. Most likely as a result, the researchers say, the population of rhinos shrunk as suitable habitat became increasingly fragmented. Since that time, Sumatran rhinoceros populations have only dwindled further due to increasing pressures related to habitat loss and hunting. "Their population bottomed out and never showed signs of recovery," Mays says. The researchers came to these conclusions by using an approach called pairwise sequential Markovian coalescent (PSMC). PSMC makes it possible to elucidate the population history of a species from the genome sequence of a single individual, which is especially important for studying rare or extinct species. The team combined PSMC with ecological niche modeling to understand how changes in population size were related to climate change in the past. The researchers estimate that the Sumatran rhinoceros population peaked at an estimated effective population size of approximately 57,800 individuals about 950,000 years ago. (Effective population size is the size of a population consistent with the genetic diversity in that population. It gives an estimate of the number of reproducing individuals contributing to a population.) By 9,000 years ago, the genome evidence suggests, the effective population size was reduced to only about 700 Sumatran rhinos. The findings suggest that climate change in the distant past reduced the genetic diversity of Sumatran rhinos, leaving them even more vulnerable to later pressures from human activity. 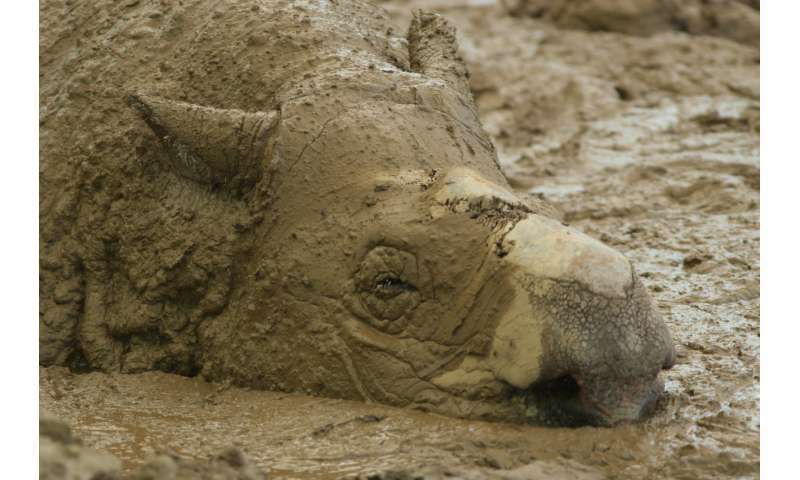 The DNA sample that Mays and his team sequenced belonged to a rhino named Ipuh, after the locality on the island of Sumatra where he was originally collected. Ipuh lived at the Cincinnati Zoo for 22 years until his death in 2013, and his remains are still on display at the Cincinnati Museum Center. 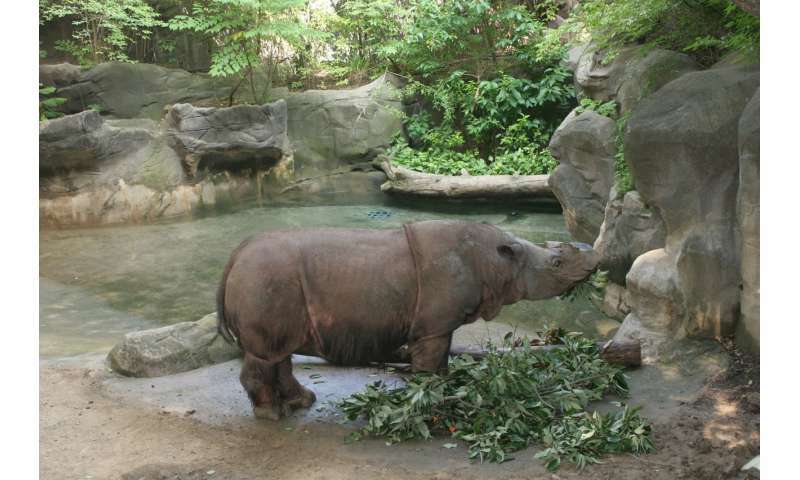 Roth reports that two of Ipuh's sons continue to live at the Sumatran Rhino Sanctuary in Sumatra. One of them has already sired two calves. "The Sumatran rhinoceros species is hanging on by a thread," Roth says. "We need to do more to save it."